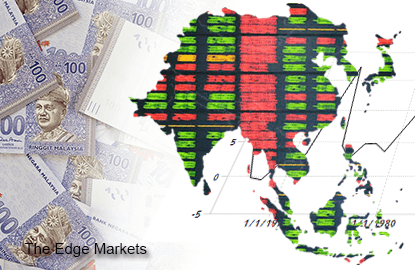 SINGAPORE (Aug 27): Emerging Asian currencies gained on Thursday as sharp rebounds in global stocks eased concerns there could be a protracted rout in financial markets, while the Indonesian rupiah rose with traders spotting direct intervention by the central bank. The rupiah earlier hit a 17-year low, but reversed direction on the intervention. The currency found further support from the government's plans for a policy package to prop up the unit and the economy. Taiwan's dollar advanced on demand from foreign investors and month-end corporate demand. China's stocks, the centre of the recent global market turmoil, rose by early afternoon, helping an index of Asian equities enjoy a 1.6% gain. US shares saw their largest one-day rise in four years. Sentiment on risky assets also improved as New York Fed President William Dudley said a US interest rate hike next month seems less appropriate given the threat posed to the world's largest economy by a recent financial market rout. Still, investors found little conviction on further rebounds in regional stocks and currencies. "Improved risk sentiment and easing equity market volatility will support Asia ex-Japan currencies temporarily," said Christopher Wong, a senior currency analyst at Maybank in Singapore. "Equity volatility is not over yet," said Wong, adding the CBOE Volatility index is still well above 2012-2015 average. The index, Wall Street's so-called fear gauge, on Monday hit its highest since January 2009, the middle of the global financial crisis. Caution also grew ahead of an annual conference in Jackson Hole, Wyoming, attended by many of the world's top central bankers. Investors will try to seek clues on when the Federal Reserve would start raising interest rates. The rupiah earlier slid to 14,135 per dollar, its weakest since July 1998. The Indonesian currency turned firmer as Bank Indonesia (BI) was spotted directly selling dollars, not though agent banks, to lift the rupiah, traders said. The unusual move indicated strong determination of the authority to support the second-worst performing Asian currency so far this year, traders said. "BI wants to show the market their presence. It is a crucial and very rare event," said a Jakarta-based currency trader. Usually, central banks use other banks such as state-run lenders for intervention. The rupiah hit a session high of 14,020 after the government said it will unveil a policy package Thursday afternoon to support the currency and the economy. Jakarta shares were up more than 3%. The Taiwan dollar advanced on demand from foreign institutional investors with local stocks up 1.4%. The island's exporters bought the currency for month-end settlements. South Korea's won rose on month-end demand from exporters. Traders continued to cover short positions on a recovery in China's stocks. Foreign investors, however, continued to dump Seoul shares, limiting the won's upside. They were net sellers in the main stock market for a 16th straight session and have unloaded a net 4.1 trillion won ($3.5 billion) during the period, Korea Exchange data showed.